PISCATAWAY, NJ. - Shea Patterson threw for 260 yards and three touchdowns, Karan Higdon ran for a pair of 1-yard scores and No. 4 Michigan kept its national championship hopes intact with a 42-7 win over Rutgers on Saturday. They showed no signs of a slip up against lowly Rutgers (1-9, 0-7) and kept the Scarlet Knights without a yard passing until the third quarter. 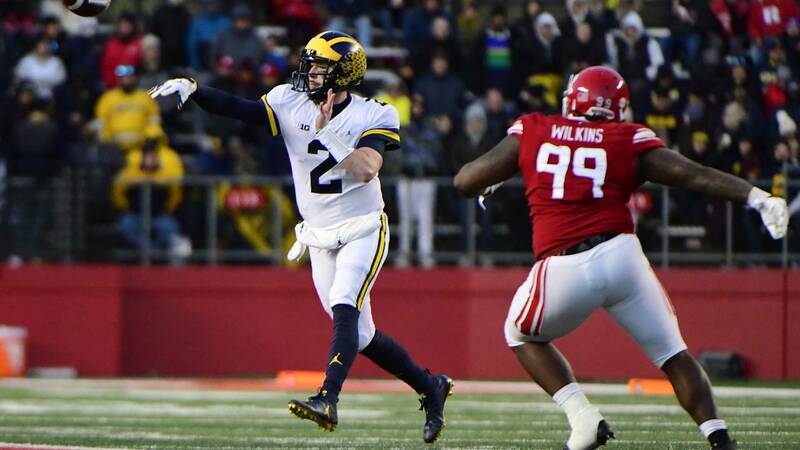 The Wolverines took the field on a chilly night in front of thousands of fans in blue and maize winter hats and jackets who turned Rutgers into a Big House East. Michigan's win was never in doubt - it was a 38 ½-point favorite and had outscored Rutgers 162-30 over their last three meetings. Michigan's 78-0 win two years ago in Piscataway was perhaps the most horrifying defeat of Rutgers' 149 seasons. The only upset Saturday came in the total time it took Michigan to score. The Wolverines didn't take the lead until Higdon's 1-yard run with 45 seconds left in the first quarter that made it 7-0. A few thousand Rutgers fans were suddenly pumped, but the threat of a monster upset was quickly wiped out. Higdon gave Rutgers a 14-7 lead on a 1-yard run, and Patterson hit Collins on a 36-yard score. Collins was comically open - the Rutgers students in the end zone seats were closer to him than any defender - and it was clear at that point the Wolverines were rolling. Patterson continued to play like the quarterback the Wolverines have needed in the Jim Harbaugh era to become legitimate national title contenders. Patterson, named a finalist this week for the Davey O'Brien award, is on the board at Las Vegas with the third-best odds to win the Heisman Trophy. He didn't necessarily play like the best player in college football against Rutgers, but the Mississippi transfer didn't have to be at his best. Patterson has thrown a touchdown pass to seven receivers this season and No. 7 was Oliver Martin in the third quarter. Martin's 16-yard haul was his first career touchdown. Patterson had his fifth three-touchdown game of the season when he found Collins again for a 10-yard score and a 35-7. Michigan waved its oversized "M'' flag, and Rutgers fans said goodbye as they flocked toward the exits. Michigan: The Wolverines are the only undefeated Big Ten team in conference play and are poised to win their first conference title since 2004. Their first national championship since 1997 certainly remains within reach. With the game out of hand, Michigan gave backup QB Joe Milton some snaps.